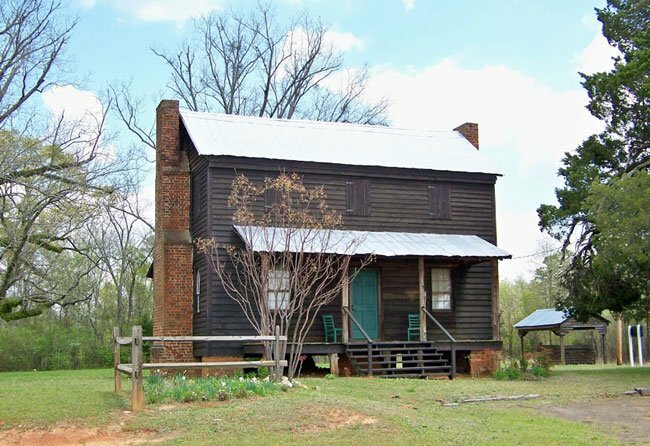 This two-story log home in Saluda dates to the late eighteenth or early nineteenth century. While there is no definitive record on the year the house was built, documentation shows that 300 surrounding acres were granted to Ogden Cockroft in 1773. In 1804 Cockroft sold this land to Captain Bryan Marsh. While Cockroft may have built this dwelling before selling the tract, architectural details such as hardware indicate that it was constructed some time in the early 1800s. Cockroft also owned another large tract of land on which he may have built his home. Regardless of when the house was built and by whom, an Edgefield District map from 1817 records Captain Marsh living here during that year (Saluda County was created in 1895 from a portion of Edgefield County). 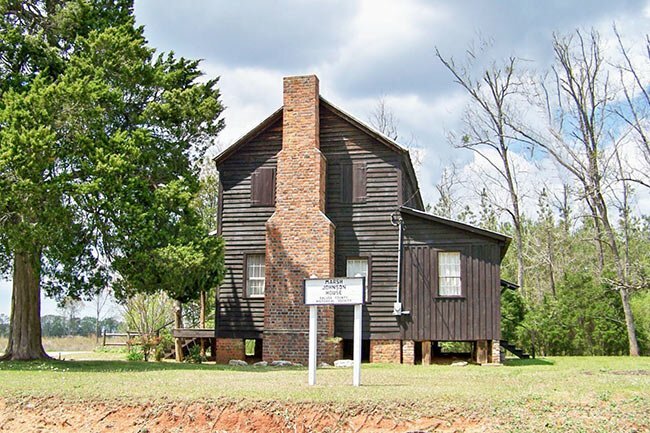 Marsh was a successful – and subsequently, wealthy – planter, owning far more property and slaves than most landowners in Edgefield District at the time. From 1810 through 1820 he expanded his holdings from 480 acres and 18 slaves to 760 acres and 30 slaves. While the number of slaves may seem small compared to the large number required to cultivate the rice crops of the Lowcountry, most agrarians from the backcountry owned few slaves, if any. Rice planters needed around 200 or more slaves to operate their fields, while cotton plantations used around 25 at most. Cotton was the primary cash crop grown in this part of the state. Following the 1817 Edgefield District map, no records of the property exist until 1846 when a plat records the tract as being owned by Josiah Howell. That year, it was sold to Isaac Johnson. It remained in the Johnson family for nearly a century when in 1945 it was sold to John Henry Hazel. At the time, the surrounding land numbered 225 acres. In 1978 Hazel deeded the house and 62 acres to his granddaughter, Virginia Witt. 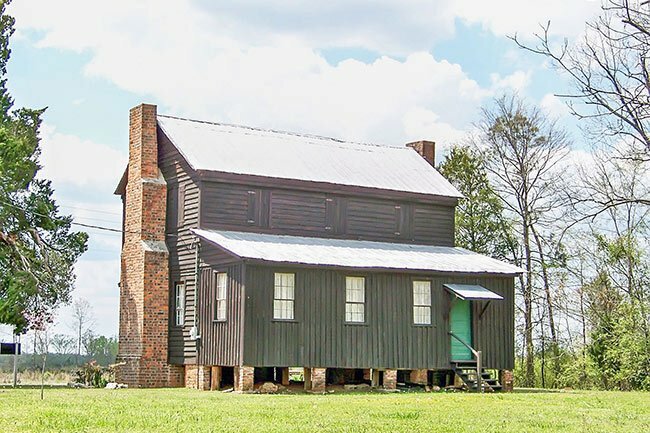 Today the home, which is one of the earliest remaining log structures in South Carolina, is owned by the Saluda Historical Society. Witt deeded the home and one acre to the society in 1990. 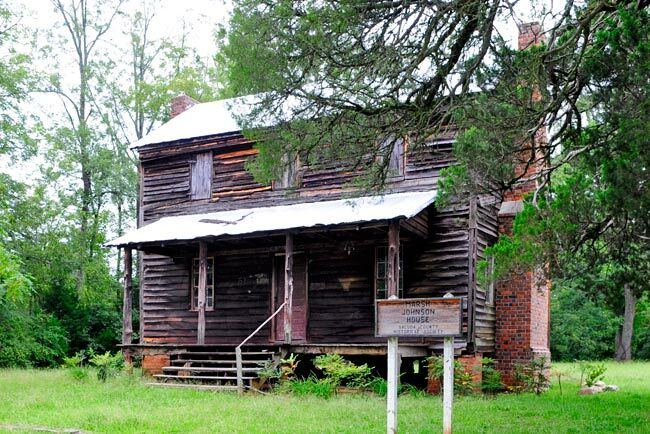 In 2013 the Saluda Historical Society restored the residence for use as a house museum. The group received a matching grant from the Daughters of the American Revolution for $3,000 for the restoration, which included stabilizing the home’s interior as well as making some cosmetic changes. Below are two photos of the Marsh-Johnson House prior to its restoration. The Marsh-Johnson House (Robert Johnson House) is a two-story farmhouse of log construction sheathed in weatherboard. The house is believed to have been built before 1817. The Marsh-Johnson House embodies construction technology and design characteristics of the rural South Carolina upcountry of the early nineteenth century. It is one of the earliest and intact log residences that has been identified in the state. The house rests on massive brick piers, which are laid in Flemish bond. A one-story, shed-roofed porch with wooden foundation piers and four rough hewn tree trunks supporting the roof spans the façade. Many of the windows retain their batten shutters. The central hall farmhouse was common in South Carolina from the colonial settlements until the early twentieth century. 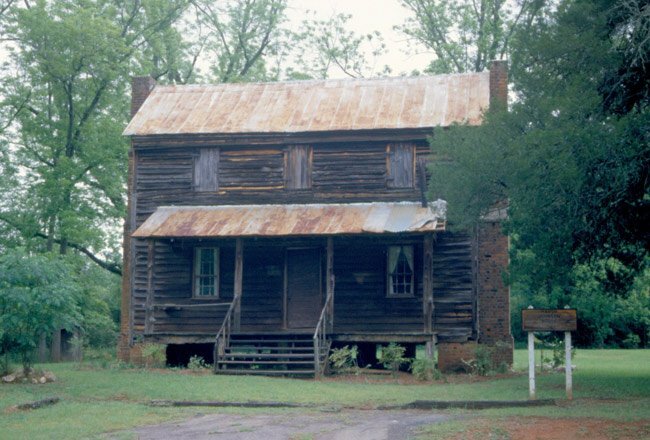 Log buildings in South Carolina were common into the mid-nineteenth century, especially in areas where there were substantial stands of large timber. Flemish bond brickwork and glazed headers, found here in the double-shouldered chimney, were in use in South Carolina from the eighteenth century into the early years of the nineteenth century.